Dunfermline's Josh Falkingham holds off Rory McAllister. 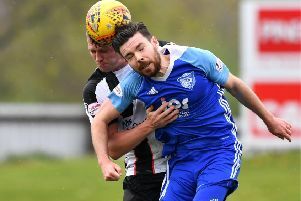 It may have been a disappointing results for the Blue Toon fans, but the eagerly anticipated game against league leaders Dunfermline on Saturday ended with a share of the spoils. Speaking after the game, Blue Toon boss Jim McInally said: “I thought it was a fair result. “We maybe edged it playing with the elements that we are used to. “We did well against a full-time team and Graeme Smith made some good saves but I thought we did okay. “We are a decent side and we were playing a team going well but our good run continues. “We missed a couple of snips in the first half but maybe they thought it was job done going into the second half with the wind in their favour. “We set up to play that way and there were some magnificent performances out there. “It was a strong bench and I find it hard keeping some players there. “Nicky Riley only came on late but I didn’t want to upset the rhythm of the team,” he said. McInally praised his side for their dedication and impressive form. “It’s a fantastic squad we have,” he said. “I know Dunfermline are a very good side and I have seen them better than SPL sides they played this season. “They will be very difficult to catch being a full time team with lots of good players and it is going take a real collapse to overtake them. Peterhead have another home match on Saturday when they play host to Albion Rovers. Albion are currently fourth in the table sitting on 28 points with three games in hand, making it another mouth-watering encounter for the Blue Toon fans.